As much as I love some of the larger Virginia vineyards, small, family-owned vineyards will always have a special place in my heart. They are usually younger vineyards, but many still have delightful wines. They tend to have friendly, intimate settings, and there is something extra special about talking to the person who actually makes the wine. I recently visited one such family-owned vineyard called Cardamon Family Vineyards. 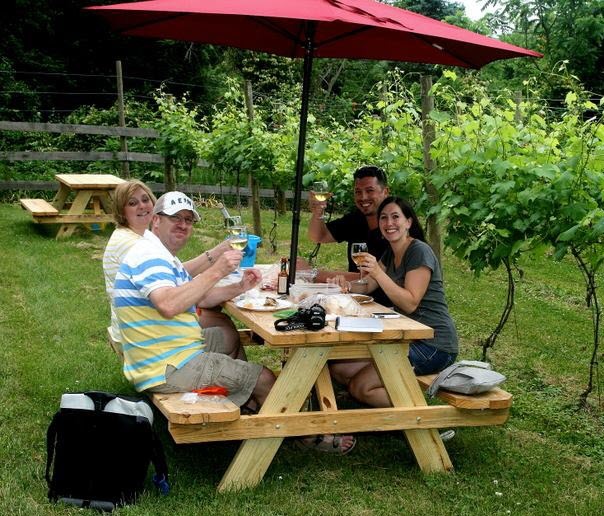 Located off of Harper’s Ferry Rd in Purcellville, VA, Cardamon has all the factors that make small wineries such charming places to stop. Chuck and Ana Cardamon opened their doors only a few weeks ago and are in the process of building a tasting room off of their house. Until the construction is finished, they are offering tastings in their wine barn. Winemaker Chuck Cardamon has had a life-long love of wine. During his Navy career, he was stationed near Napa Valley, and after retiring, he got to experience wineries in Livermore Valley while attending culinary school. The Cardamons moved to Virginia in 2008 and planted vines of their own. Cardamon is currently serving three different white wines: Vino di Mele, Cuvee Blanc, and RKATZ. The Vino di Mele is created from 100% apple juice, and unlike most apple wines, it is dry, not sweet. Their Cuvee Blanc is fermented in Minnesota Oak barrels and is a mix of Chardonnay, Semillon, Pinot Gris, and Sauvignon Blanc. It has an appealing wood scent and a soft citrus flavor. Last but not least, the RKATZ is made from 100% Rkatzitelli grapes grown in Horton Vineyards. It is stainless steel fermented, giving it a nice, clean citrus flavor. 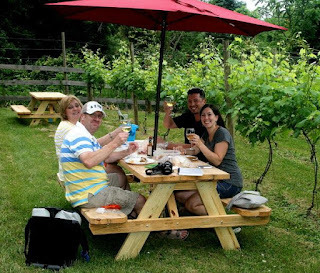 After our tasting, Dan and I sat on a picnic table with some family friends and shared a delicious picnic, enjoying a bottle of Vino di Mele with our meal. We really enjoyed our visit to Cardamon Family Vineyards. The friendly atmosphere, the chance to talk with Chuck and Ana about their love of wine, and the delicious wines paired with creative salsas made for a wonderful visit. Dan and I left with three extra bottles to hold us over until we can visit again. When you stop at Cardamon for a visit, be sure to tell them that Erin and Dan from At The Lamppost say “Hi!”! Chuck and Ana are my cousins and I am SOOOOO proud to call them family! They're wonderful people and I knew their winery endeavor would be a smash hit! !